For more information on “What to Expect at Tryouts” please scroll down past the flyer. If you are NEW to our competitive program and wish to go directly to the Tryout Pre-Registration page, please click here. If you are a CURRENT member of our competitive team, and wish to complete the Intent to Continue form, please log in through your customer portal and register under Events. 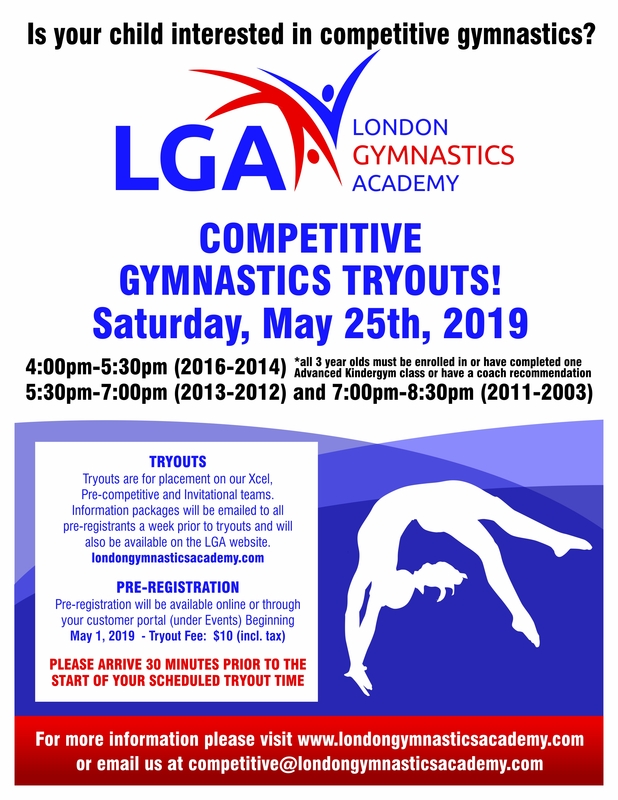 We are very excited and are looking forward to LGA’s annual Competitive Team tryouts being held on Saturday, May 25th. Please see the Competitive Tryout Flyer (also posted in the gym and online) for details of tryout time (based on birth year). Parents will have the option to pre-register online (will close Fri, 24th) or in person before the tryout begins. All athletes that are trying out will need to proceed to the registration table upon arrival to receive a tryout # and have a photo (head shot) taken before entering the gym. Please note that the photo will ONLY be shared with LGA staff exclusively. Please arrive 30 min prior to the posted try out time, as we will begin each session promptly! Athletes will be placed into groups and will rotate around the gym to different strength and flexibility stations (chin ups, leg lifts, rope climb, splits, bridges, etc.). Once the strength and flexibility testing is complete, athletes will again rotate with their group to the uneven bars, balance beam, vault and floor to perform for LGA staff. Athletes will be asked to perform from a list of predetermined skills by a NCCP certified coach. Coaches will stand in/spot skills as needed to ensure safety of your child! All athletes should wear a gymnastics suit. If your child does not have a suit, please have your child wear shorts and a t-shirt. No socks! Water bottles will need to be placed on the shelves at the entrance into the gym, or we also have a water fountain. If you register at the gym, please remember to bring the $10 registration fee with you. Please understand that this is a try out. We will accept as many athletes as we can into our programs, ensuring the correct placement on teams. If your child is not accepted on a competitive team, we ask that you remain positive with your child and encourage them to try out again the following year.